A thermo jar is the new, easy, energy-saving, earth-friendly and healthy way to cook. And it makes the ultimate portable meal! This recipe was first published in Amy Beh’s column, Cook’s Nook. Wash and soak barley and brown rice for 1 hour and drain well. Rinse the yuk chok and soak for 20 minutes. Cut into shreds. Bring water to a boil in a pot, add barley, brown rice, yuk chuk and wai sun. Boil briefly, then simmer for 15 minutes. Pour enough boiling water into a thermal food jar. Close and allow the jar to preheat for 2 minutes then pour out the water. Add the dried longan, red dates, kei chi and seasoning to the barley and rice mixture. Stir to combine. Pour the mixture into the food jar. Close the jar tightly and set aside for about 2 hours. To serve, pour the porridge out into a bowl. 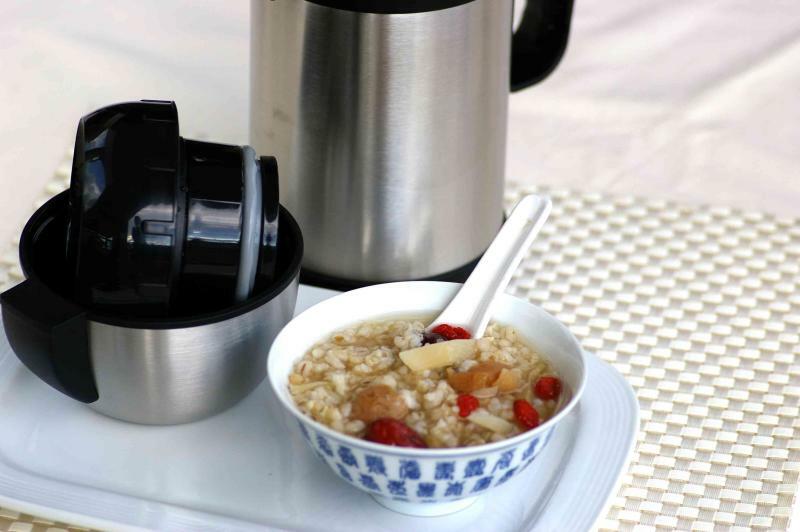 If the barley and rice have absorbed all the water while being steeped in the jar, you can add extra boiling water to the porridge to bring it back to the desired consistency. Serve warm or hot, with a fresh sprinkling of pepper for a lively taste.